Whether it was about power, control, personalities, timing or some combination thereof, Kevin Garnett's loud career ended quietly in Minnesota. If you’ve had lingering questions since Kevin Garnett’s retirement in September — such as, why are the Wolves essentially paying him not to play this season? And wouldn’t there have been room on the roster for someone like him on a team full of young players? 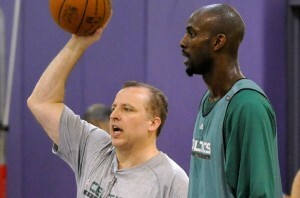 — KG comes as close as I believe he has come to tying up those loose ends in a recent interview with Kevin McHale. In a roughly four-minute segment that you can view on NBA.com, Garnett talks about what happened in Minnesota the second time around. For those who forgot the play-by-play, Flip Saunders acquired Garnett in the middle of the 2014-15 season to serve essentially as a mentor for younger players at the end of his career. Saunders died Oct. 25, 2015 — right before the season began. Sam Mitchell, a mentor to Garnett during his younger days, took over as interim coach and Garnett appeared in 38 games. Mitchell was let go in favor of Tom Thibodeau, who also has control of basketball operations. If the speculation was that Saunders and Thibodeau had different visions for the Wolves and Garnett’s role … well, that’s basically Garnett’s version of what happened. Garnett explained what he thought his role was in Minnesota. Now: It’s entirely possible (even likely) that you would hear a different version of that story from the perspective of Thibodeau and others. Some of the core facts might be the same, but their notion of what Garnett was bringing to the organization had to have been different than what KG believed it was. Whatever the case, you had a veteran player known for his defensive intensity who didn’t mesh with a coach who loves defense and who was a key assistant in Boston when KG won a ring. Whether it was about power, control, personalities, timing or some combination thereof, a loud career ended quietly.